Horses are not native to Australia but official records indicate that they have been here as long as Europeans as the first ones to arrive came in with the First Fleet. They were mostly horses from the Barbary Coast and were used in the early penal colonies to help establish human settlement. More shipments arrived over time and eventually included thoroughbred racehorses, the ancestors of many of the pony breeds we have here now and of course pure and part-bred Arabians. An account of one of the earliest documented palominos is recorded by the Australian Stock Horse Society, namely Beardmore's Saladin, a palomino pony stallion in the early 1870's that was purported to have been imported and was supposedly of Arabian bloodlines. His son / grandson, also called Saladin and also a palomino, is one of the ASHS's designated historical horses of significance due to his influence on working stock throughout NSW and Victoria. His female descendants in particular were often crossed with stallions of Cecil descent to produce quality working horses with plenty of natural ability and cow sense. What is also known is that many of the horses from the original cattle stations, which included dilute descendants of Saladin, were released into the wild when their usefulness came to an end and their dilute descendants can be found today in many of the mobs of brumbies now roaming the various national parks in the area. Saladin is also found in the pedigrees some of the early dilutes registered with the Australian Pony Stud Book and in some of the palominos registered by the Australian Palomino Horsebreeders Association which was formed in 1948. 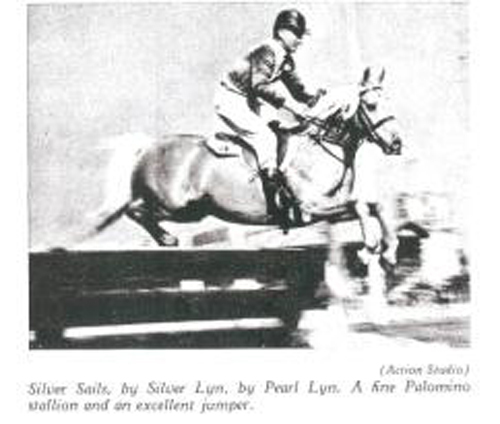 The first stallion to be accepted into the APHA register was the renowned show jumper and performance horse Silver Sails who in all likelihood goes back to a creamy mare of Saladin descent.